CarGurus has 165,005 nationwide 1500 listings starting at $4,999. Ram’s new Limited trim raises the bar for luxury pickups, while the EcoDiesel V6 could be the perfect blend of grunt and utility in a light-duty truck. 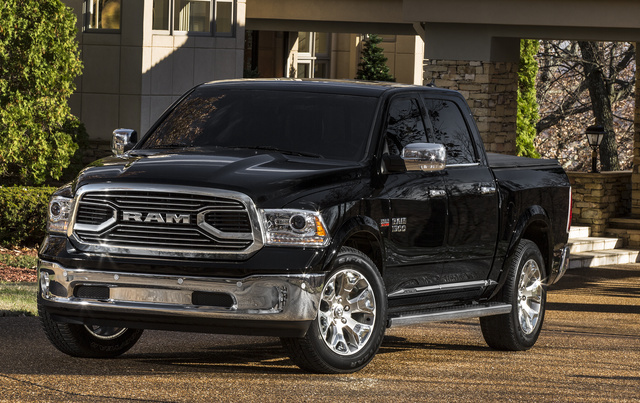 The 2016 Ram 1500 Limited is quite possibly the most luxurious truck we’ve ever driven. It gives the GMC Sierra Denali a run for its money. But Ram’s first true entrant in the “luxury truck” market (yes, that’s a thing) delivers with items that are available in the rest of the Ram 1500 lineup, including its innovative EcoDiesel V6 engine and an available air suspension that will have you thinking you’re behind the wheel of a sedan–albeit a very tall sedan! There are trucks for worksites and trucks for the campground, but this is a truck for the oil executive that needs to let the boys at the country club know he made his millions drilling for crude. If that’s the image you want to portray, the Ram Limited is a “Dallas” TV marathon on wheels. Subtlety is not a trait the designers at Ram hold dear. 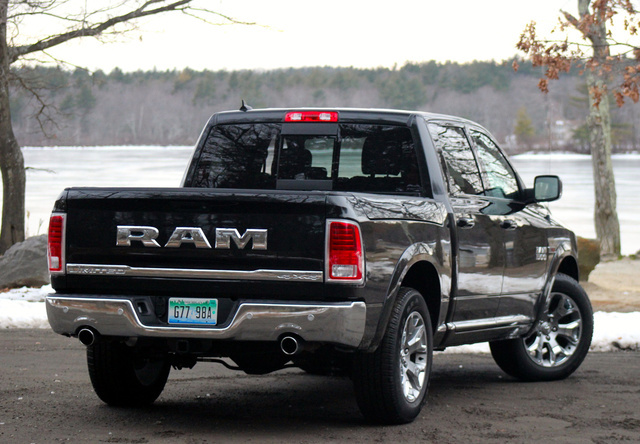 In fact, every redesign of the Ram lineup comes with bigger lettering, bigger badges, and seemingly bolder styling. The same can certainly be said for the new Limited trim. The top end of the Ram 1500 lineup features a grille design completely unique to the Ram lineup. It eschews the crosshair grille pattern in favor of a unique multi-faceted design. This gives it a unique touch that separates it from less-expensive Rams, and it's something Ford does with its Platinum, King Ranch, and Limited trims, and GMC does the same with the Sierra Denali. The Ram 1500 Limited (starting at $52,320) also features massive R-A-M lettering across the tailgate, chrome bumpers (a $200 option), and a seriously cool set of 20-inch wheels that are a polished aluminum design with chrome inserts. Inside, the Limited gets navigation, heated/cooled seats, a heated steering wheel, and full leather seating, with leather door inserts and center-console lid. The leather upholstery also features western-inspired stitching, really driving home the fact that Ram wants this truck to be shopped against the King Ranch. But Ram has often had sporadic special editions (think Big Horn, Lonestar, and Outdoorsman editions), versus long-running franchises like Ford's King Ranch. The unique touches are a start for the “luxury truck” concept, but it seems like the Ram needs something more that we couldn’t put our fingers on to take it to the next level of pickup luxury. 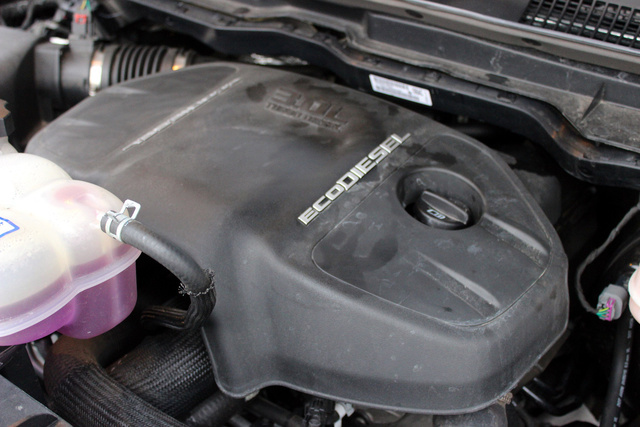 Our test vehicle featured the latest version of Chrysler’s EcoDiesel V6. Displacing 3.0 liters, it put down 240 horsepower and an impressive 420 pound-feet of torque. For those who don’t know, torque is in many ways the more crucial metric for trucks, as it's what you use to tow, haul, and pull away from a standstill. The EcoDiesel unit makes this impressive torque while returning 20 mpg city/28 highway for the rear-wheel-drive version and 19/27 for our 4-wheel-drive edition. When properly equipped, a Ram 1500 equipped with this engine can tow up to 9,210 pounds. If diesel is not your thing, you can opt for the base gas 3.6-liter V6, making 305 horsepower and 269 pound-feet of torque. This engine returns 18 mpg city/25 highway while managing a 7,610-pound tow rating. The top-tier gas engine is the 5.7-liter Hemi V8, which puts down 395 horsepower and 410 pound-feet of torque. The V8 can tow over 10,500 pounds when properly equipped, and this engine is rated by the EPA at 15 mpg city/22 highway. Power is sent through an 8-speed automatic transmission, which is key to the Ram achieving its impressive fuel economy. This transmission allows the EcoDiesel to stay right in the ideal diesel power band, which is absolutely crucial for both performance and fuel economy. Our only problem with so many gears was that in some acceleration scenarios, the transmission confused itself looking for the right one. The 8-speed unit is part of a suite of features geared toward optimal fuel economy. There are also shutters in the grille and a four-corner air suspension that lowers at highway speeds for improved aerodynamics. Plenty of real estate in the cabin affords you great everyday utility options, but it comes at a price. The Ram’s Crew Cab has 4 doors and seating for 5, with plenty of legroom, headroom, and shoulder room. The center console is massive and deep, allowing you to store tools in its well. And for other items, the Limited features a center console with 2 cupholders (there are plenty of other cupholders in the doors and in the second row) and storage solutions. The price you pay for all this interior space is a seriously compromised truck bed — the part that makes a truck a truck! But Ram provides tools to make the best use of that space, including a bed extender, spray-on bed liner (which is seriously recommended over a “drop-in” liner), LED bed lights, and Chrysler’s innovative RamBox cargo system. 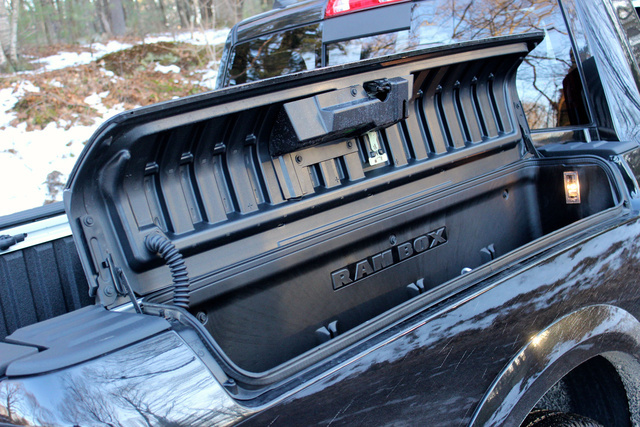 The RamBox is a $1,295 option and worth every penny. These are lockable, drainable storage compartments found on either side of the bed. They feature power locks, connected to the key fob and central power locks, and can hold a serious amount of gear, guns, fishing rods — you name it. But the RamBox system also cuts down on bed space. If you plan to use the bed for a lot of mulch and move piles of soil often, you might want to opt for the bed without the RamBox. But if you're camping, going on road trips, or want to keep your tools and other gear safe, the RamBox is a supremely innovative solution. The Ram Limited comes loaded with navigation, satellite radio, an Alpine stereo with 9 speakers including a subwoofer, and a large digital screen located in the center of the instrument panel. 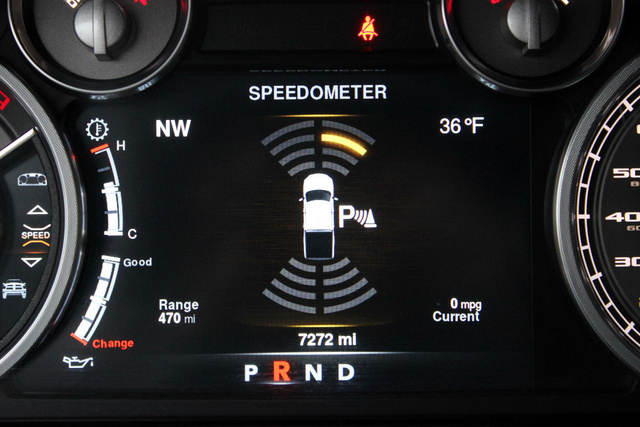 Flanked by conventional gauges, this screen is customizable and allows you to access many of the truck’s functions, such as audio controls and various other settings. But Ram hasn’t forgotten about the bottom end of the lineup, as it has made Bluetooth hands-free connectivity standard on all trims. With the new cell-phone/distracted-driving laws in many cities and states, hands-free functionality will be crucial for work crews and contractors constantly on the move. There’s no escaping the fact that trucks in 2016 are massive — even light-duty pickups. And with towering hoods and dramatic fenders, the sense of space around you can often feel hampered. To that end, our test model came equipped with a standard backup camera, and more important, ParkSense front and rear parking sensors. With its long wheelbase and massive proportions, these features are absolutely crucial for parking a big truck like the Ram. Considering Ram positions this as its “black-tie” truck and it may therefore spend some time in the city, the parking sensors are absolutely crucial for parallel parking. Elsewhere, the Ram features a full complement of front and side-impact airbags. This vehicle did not feature a lane-departure warning system or blind-spot monitoring, but trucks typically feature large, wide-angle mirrors and pretty good overall highway visibility. 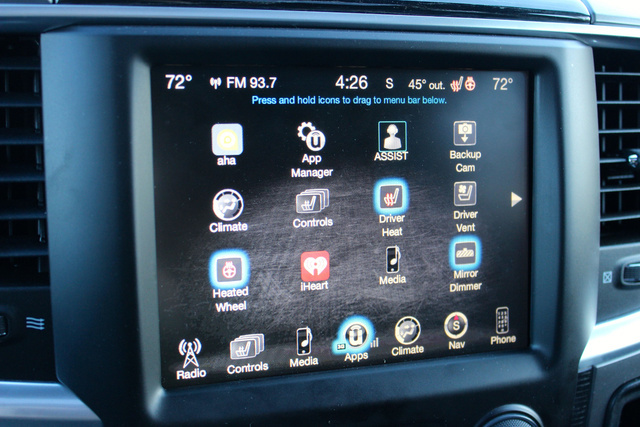 The base trim of the 2016 Ram 1500 is the Tradesman and carries an MSRP of $26,145, and despite being on the bottom end of the lineup, it comes with the aforementioned Bluetooth hands-free system. A step up is the Ram 1500 Express at $27,525 — it adds a standard V8, Class 4 trailer hitch, and Uconnect 5-inch touchscreen. The Ram Sport features body-color bumpers, HID projector headlamps, a standard air suspension, and the larger 8.4-inch touchscreen system like the one found in our test model. The Laramie is one of the higher-end trims and includes heated leather seats, 20-inch wheels, and the ParkSense system with backup camera. If Ram wants to play in the “luxury truck” market, it certainly has priced this truck to play ball. The Limited starts at $52,320, and our fully loaded Limited 4x4 Crew Cab test model will set you back $61,480. 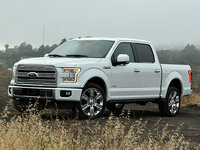 That includes the EcoDiesel V6 ($3,120), chrome bumper package ($200), and RamBox system ($1,295). The GMC Sierra 1500 Denali starts at $50,890, and similarly equipped it will set you back about $56,000. A Ford F-150 King Ranch Super Crew with 4x4 and EcoBoost V6 engine starts at $53,691 and will cost $61,000 with similar options packages selected. But neither of these trucks has the EcoDiesel V6, and neither has the innovative RamBox. The air suspension in our Ram test vehicle has been one of the smoothest and most car-like we’ve ever found in a truck. If you plan to spend this kind of money for a pickup, you’d be hard pressed to find one that's more appealing to make the daily commute! 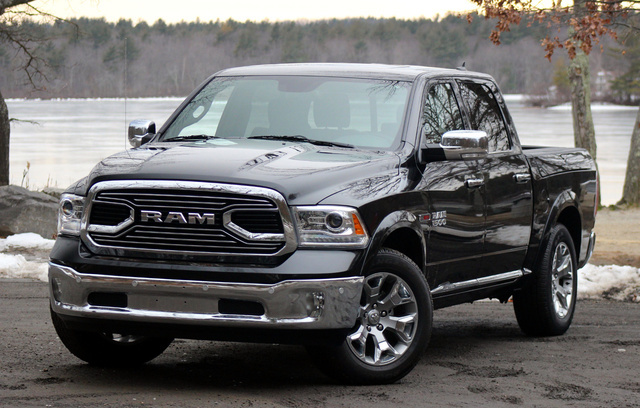 What's your take on the 2016 Ram 1500? GuruWRBW6 Best truck ever and can’t wait to get my hands on another one! Had a Dodge and now leasing to feel out a Chevy, and boy I can’t wait to get back into a Dodge. Best truck ever! Users ranked 2016 Ram 1500 against other cars which they drove/owned. Each ranking was based on 9 categories. Here is the summary of top rankings. Have you driven a 2016 Ram 1500? How Good Is The Ram V-6 3.6 Liter Engine ? What's the review on gas mpg and power to climb hills and acceleration ? I’m looking to get a Leveling Kit for my 2016 Ram 1500 Big Horn 4x4, how do I know if I have Air Ride? High Mileage, 2 Years Old, Worth It? Dodge Ram 2016 Air Suspension Out, Can Vehicle Be Driven?